Adu said he doesn’t understand why he never got that chance. Instead, for much of the season, it has been Michael Farfan that has been in the No. 10 role. Opinion about Adu is divided among Union fans. His supporters remember a brilliant move or a beautifully delivered ball, while his detractors remember the series of step-overs that ended in a flop or his failure to provide defensive coverage. Meanwhile, Farfan is held up as an example of the vast potential on the young Union squad, even though at 24 he is a year older than Adu. I decided to go through the season’s match stats available through the Opta-powered chalkboards at MLSsoccer.com in an attempt to see where each player excelled beyond the other and also better understand both the criticism and praise each receives. There are some 40 individual statistical events separated into six categories recorded for field players on the Opta chalkboards. With 25 games to go through, I selected 14 offensive categories and six defensive categories to examine. 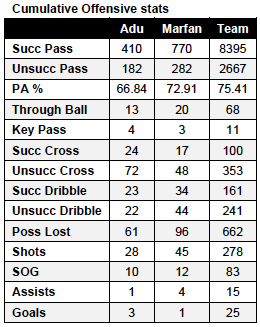 In addition to individual numbers for Adu and Farfan, I also recorded the team’s numbers for each category for the sake of context. Regardless of whether you’re a fan of either player, each has indisputably seen significant playing time out of their natural position. Farfan, for example, has started everywhere from right fullback and right midfield to attacking midfielder and forward. This will necessarily have some effect on each player’s individual numbers. Additionally, Farfan (24 appearances, 23 starts, 2082 minutes) has seen significantly more playing time than Adu (20 appearances, 17 starts, 1269 minutes). This is mainly due to Adu’s time with the US U-23 squad for the unsuccessful Olympic qualification campaign at the start of the season, although more recently this has been due to form and internal disciplinary reasons. This is also because Farfan tends to play complete games. Farfan has more through balls, successful dribbles, shots, shots on goal and assists. Adu has more key passes, successful crosses (nearly a quarter of the team’s total), and goals. 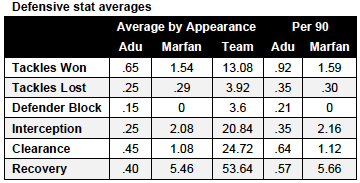 What’s remarkable is how similar the numbers are for Adu and Farfa n when the season totals are averaged. 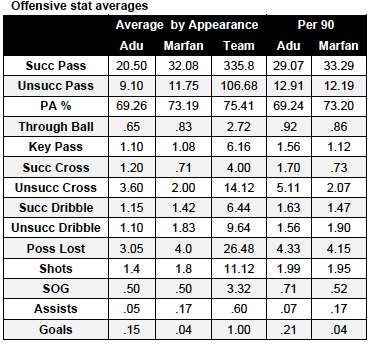 In fact, outside of passing statistics, the only categories that show a difference of more than a .5 — which would mean that an additional instance of a particular event could be expected to happen once every 2 games — are successful cross and unsuccessful cross for Adu and unsuccessful dribble and possession lost for Farfan. Adu has long been criticized for a lack of defensive quality. Comparing his overall numbers with those of Farfan, it’s clear that Farfan is more aggressive defensively, attempting and winning many more tackles than Adu. Whether or not it’s a function of playing more centrally, Farfan also has far more pass interceptions, clearances, and recoveries (when a player wins back a loose ball or it has been played to him). Where Adu outperforms Farfan is with defender blocks, all of which have come during corners, including the goal line block against Portland. When we look at the averages, Farfan’s better defensive numbers remain. This holds true when the numbers are equalized by minutes played. In fact, Farfan actually has slightly fewer tackles lost. Either way, Farfan’s industry in the midfield is especially apparent in terms of balls recovered, which makes up, on average, more than 10 percent of the Union’s numbers. 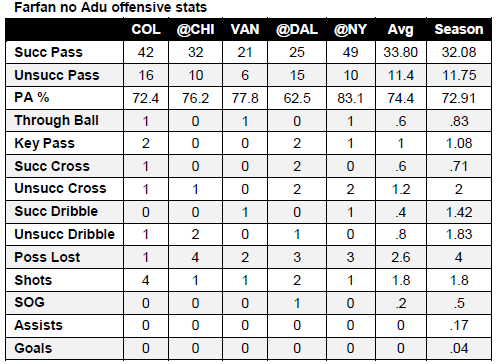 When I looked at the offensive and defensive stats for Adu and Farfan, I expected to see big turnover numbers from Adu. That may be because visions of Adu deploying fancy footwork while taking on a defender and then failing spectacularly are the kind of memory I have all too often. But the reason such memories stand out is that these plays are generally scoring opportunities in or around the box, a spectacular moment whichever way the play goes. That Adu has more crosses wasn’t surprising, given the fact that he’s played outside precisely so he can deliver them. It seems pretty intuitive that crosses should have a relatively low success rate. That Adu, on average, is successful 25 percent of the time with his crosses is probably a decent number. If the Union had more height for him to aim for, perhaps the number would be better still. With the obvious exception of defensive stats — and it’s really no surprise Farfan has much better numbers there — what really surprised me was how similar so many offensive numbers were for the two. I’m not sure I know what the similarities mean. I do know the averages for shots and shots on goal are disappointingly low, as they are for the team as a whole. Other writers on PSP have examined the high expectations that have, rightly or wrongly, surrounded Adu ever since he joined the league. A recent post at the 700 Level concluded that the Union has a better record when Adu is on the pitch for more than 45 minutes and that the team has a better goal differential when he plays. While Adu continues to face questions about whether he’ll ever fulfill the potential, discussion of Farfan describes a player on the rise whose potential is only now being comprehended and, if realized, could make him part of the next generation of national team stars. Whatever the case, the Union have two players who can fill the No. 10 role into the future, one who expected to be given the role when he arrived, and another that is only now beginning to discover his potential in the position. One costs $519,000 a year, while the other costs $94,700. Fans will continue to debate the return on investment. Looking ahead to 2013, you can be certain that the Union will be doing the same. After the above post was published, several readers expressed an interest in what Farfan’s numbers look like when Adu is not playing, so I gathered that information together in the charts below. Farfan has 5 appearances (4 starts, 405 minutes) when Adu did not play, including being subbed on at the start of the half against Vancouver. In each of the games he is listed as a midfielder except for the away game against Dallas, where he is listed as a defender. Despite recording one of his lowest passing accuracy percentages of the season in that game (against DC his passing accuracy was 59.6 percent), he still managed to record 2 key passes and 2 successful crosses from 4 crosses attempted. In the 5 games without Adu, his passing averages are generally better, as is the possession lost average, while the shots average is the same. To varying relatively smaller degrees, the opposite is true of the rest of his offensive stats. Looking at Farfan’s defensive stats, the Dallas game again stands out, which makes sense since he was at right back, although he didn’t record a successful tackle in that game. Nevertheless, the average for tackles won is the only defensive stat that is much different from the season averages. For those who are interested in Adu’s numbers when Farfan did not play, the pickings are much more slim. Adu was away at the Olympic qualifiers for the Vancouver game in which Farfan did not start. There are five other matches in which Farfan was either subbed out before the end of a game or did not play. In the away games against Portland and Chivas USA, Adu was subbed out before Farfan. In the away games against Seattle and Toronto, Farfan was subbed out in the 76th and 83rd minute, respectively, while Adu went the full 90. Finally, while Farfan did not play in the recent match against Montreal and Adu started, Adu was subbed out after 45 minutes. Not much can be learned from looking at the total of 66 minutes in which Adu was on the field and Farfan was not. To continue some of this thinking, the Central Winger has been very progressive in finding new ways to analyze soccer data. Here is a link to a recent article that reports the quality of passing by M. Farfan (unfortunately no Adu): http://www.mlssoccer.com/news/article/2012/09/04/central-winger-finding-no-8-klinsmanns-midfield . Dig deeper and you can find more from them. This is an important exercise, if you believe as I do that there are many intangibles hidden in these numbers. Also as a potential substory its intriguing to me that we are reliant on statistics to validate the quality of soccer players. USMNT fans are falling back in love with Jozy Altidore now that he is finally getting the ball in the net, but did he possess some of those qualities a couple years ago; did we miss something about Hercules Gomez’s game when he was unsuccessful in catching on with an MLS team. As an extension of this are we not evaluating our young players appropriately at key positions such as midfield that are not stat heavy (interesting we don’t have an abundance of creative midfielders in the US international pool). Do we as a soccer culture place too much emphasis on qualities that are easily identifiable–hustle factor, player size, and physical play; but miss out on more subtle attributes such as technical skills and the ability to make the most difficult passes? These are important questions if we want to progress our players with the most potential to the next level. I link to the Central Winger article in the post. When I read it I wanted to learn more about the “quality added” component of the calculations. The article says, “This is calculated by looking at the relative difficulty of each of their passes and rewarding appropriately based upon my model.” My question is, how is this “relative difficulty” determined and then consistently applied? There are certainly intangibles that are difficult to measure statistically but how do we prevent subjective judgements from influencing what otherwise appears to be objective measurement? Additionally, for those of us who have only the chalkboards to work with, determining something like secondary pass accuracy, while very much desired, is extremely difficult. My kingdom for an Opta account! Thanks for reading, Gordon, I enjoyed your post at The 700 Level. I kind of have a problem with the statistic that the team wins more games with Adu than without. MAny of the games that Adu appeared in were actually Won when he was subbed off the field. For the record, I at times feel like the World’s biggest Adu defender. In actuality there are many aspects of his game I think he can improve on and wish he would. It would be interesting to know what Marfan’s stats are with Freddy in the team and without him in the team. For me – we’ve been far better with both playing than without, possibly due to when Adu isn’t playing (and especially when we are playing with only 1 striker) to stop the Union, all the other team has to do is stop Marfan. Add Adu in there, and suddenly Marfan gets more space to create. I really don’t see any reason why the 2 can’t terrorise defenses for the next few years. Barry, I gathered the numbers you were interested in and added them at the bottom of the post along with a few observations. Interesting. I really don’t know why we just don’t throw Marfan on the wing. Practically his entire highlight reel consists of movement down the wing to the corner and up the endline toward goal. Like any great winger he knows how to use dead space and time and time again uses his 1v1 abilities to turn nothing into something. Adu should be kept in the middle completing passes and ripping shots from up top like we have seen him do. Not to knock Freddy’s dribbling, but I think we could all agree he tries to do too much. Marfan beats people and does something productive whereas Freddy gets ahead of himself and thinks he can’t be stopped. That’s just my two cents. Excellent post, Ed. One of your best. As you know from the last game, when Marfan has an atrocious game, like the Crew game, he gets a pass from the fans and most of the media. 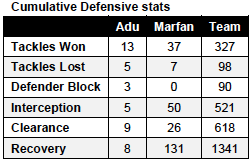 I am not bashing Marfan, but the level of scrutiny aimed at Adu is astounding. The point made above by Barry Evans about having them both on the field to relieve pressure for the other is very astute. I, for one would like for Adu to be given the keys and have the play run through him from an Attacking Mid position. I agree that Adu is a lightning rod and, given how I’m as likely as the next guy to be critical of Adu while giving Farfan a pass, I can’t say enough how surprised I was at how similar their numbers are (with the exception of defense). Eli’s comments about how Adu/Farfan played together in the NE game really stuck in my head after I read them and I’m excited to see what kind of partnership might develop between the two. After all, what better time to play Adu in his preferred position than now? Yea I’m thinking the same thing. Those two guys are our best hope for success. Now Hack needs to sort it out and get them both working together. This was extremely interesting, and I have for years been thinking that the statistical analysis that is developing on many levels for soccer can lead to exactly the type os discussion that this has engendered. I don’t right now have the ability to look into the actual definitions of the various categories, but is there an adjustment available for bad reception by the target of the pass? For example, I see the distinction that is being made about the difficult pass adjustment, but I can also see where Freddy’s poor passing numbers could also be adjusted for bad technique by the target, or a failed run. (Think about the scoring decision between a wild pitch and a passed ball; similarly here, we could see that Freddy is actually more efficient with his U-23 teammates because they are better at receiving than his Union teammates. Such a stat would be at least a bit subjective, but might help to level the numbers a bit. Tim, the Central Winger article discussed above includes links to another article that I think addresses just the issue you’re talking about, which the article’s author describes as secondary passes. The author’s starting point, if I remember correctly, was how defenders get high passing numbers as a result of passing the ball amongst themselves in the build up to going forward. Also considered is not just how to account for how the receiver of a pass may bungle a ball, but those situations where a passer delivers a ball to player who has nowhere to go with it. As things stand now, the passer gets a completion while the recipient gets a turnover. I try to link to the Central Winger column in the daily roundups whenever it comes out (I think it comes out on Tuesdays or Wednesdays on the MLS site) – it’s a great read and a regular example of the work people are trying to do to make soccer stats more elegant in the kinds of insights they can provide into the game. I’m not really much of a math guy but there are folks out there doing some really inspiring work. Thanks for reading! Any discussion regarding Adu vs. Whomever isn’t complete without discussing salary. Allow me to go all Soccernomics for a bit. Freddy Adu has a base salary of $400,000 (12.45% of Union’s 2012 MLS Salary budget) and is guarenteed $519,000 per year (14.58% of Union’s annual payroll). Michael Farfan’s base salary is $57,200 (2% of salary budget) and $94,700 guarenteed (2.66% of total payroll). Ed did a fantastic job highlighting the statistics both players have amassed this season, which only goes to illustrate that the Union are not getting good value out of Freddy Adu’s production. For all the talk of Freddy’s wonderful passing and distribution, he’s got a whopping total of one assist. Compare that to Marfan’s four. Digesting all the figures Ed has laid out for our review, the Union are getting similar production from Marfan at 18% of Freddy’s salary. I’m done slating Freddy Adu, it’s unproductive and takes my energy away from supporting the great cast of players we do have on this team. Does Freddy make our team better? Marginally yes, but a team’s highest paid player should do more than make than make the team just a little better. With a little scouting work, the Philadelphia Union can surely find a better way to utilize Freddy’s salary and increase the team’s offensive output. I’d be real careful assuming that if Freddy departs in the offseason that the FO is going to replace him. We may just continue assembling young American kids with loads of potential. I HOPE I’M WRONG! Freddy’s last two matches have tipped the Freddy-see-saw in Fred’s favor, in my opinion at least. If he could play this way every match, Fred would be our best player. He needs to get back to the fundamentals of football and stop the Ronaldinho act. I hope to see Adu close out this awful season with intelligent play out of the CAM position. If he can accomplish this, he will merit some of his salary and give the Union something to build upon. As of now, there is no offensive foundation for which to add to. Unfortunately, we may have inept ownership that lacks the monetary resources needed to add skilled players. If this is the case, which I feel it is, we will be sweeping out the table basement for years to come. In order for us to be competitive, we must add players, who are talented NOW. We have enough fringe players, who may one day blossom. Good points, although, I actually don’t mind Freddy going to his bag of tricks sometimes. You have to let creative players be creative and express themselves. When he’s having fun, his confidence builds creativity. Just look at how he played against NYRB at the beginning of the year (before being sent off). He had more stepovers in that game than you’ll see in Riverdance, and yet he was fantastic and the most dangerous player on the pitch. While Freddy does hold up play at times, it isn’t always a bad thing – especially in the middle of the pitch – this is where his tricks play to his advantage. In the CAM role, it allows him the time and space to see the runs being made. On the wing, it is less helpful for sure. As for salary, yeah, I doubt any other team would continue to pay that number (let alone be thrilled to sign him), so we should have some leverege when it comes to renegotiating. Yet, I think the stats above show just how biased everyone is against Freddy. Let him play! The key point is that both players are being played out of position. There is no reason that this should be happening. What actually is their correct position? After all these matches I’m really starting to to favor Marfan on the wing with Freddy running the offense from the CM position. I know Marfan has HUGE potential there but…..
Usage of English in professional field. Please feel free to coohse any field of your choice. And please, write as much as your can. My email is feel free to contact me for any questions. It’s my homework and i’m submitting in 6days time. Thanks.